Brazos County (590 sq miles) is better known for producing from the Austin Chalk and conventional formations. The county does fall in the fairway of the oil maturity window of the Eagle Ford Shale, and activity is beginning to take off. In 2013, Halcon Resources planned to spend over $100 million developing the Eagle Ford in Brazos County. 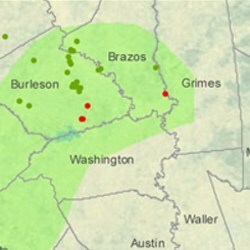 Brazos County is located approximately 90 miles northwest of Houston. The largest towns in the county are Bryan, College Station, Kurten, Millican, and Wixon Valley. Bryan serves as the county seat and College Station is home to Texas A&M University. County services of interest to oil and gas lease owners include the Brazos County Appraisal District (tax collector) office and the Brazos County Clerk (property records) office. Join the Brazos County Discussion Group today - your voice counts! Anadarko, Enervest, Halcon, PetroMax Operating, Unit Petroleum, and Vess Oil have the largest producing operations in the county.